Want to stay in touch? Tap a connected touch lamp, and the WiFi-connected lamp of a friend, family member—or an entire network of your favorite people—will light up in your special color. (There are over 200 to pick from, so pretty much everyone can have a special color.) It's a simple but meaningful way to check in, say hello, and keep relationships strong. Set-up is easy, and you can pair as many lamps as you like. Made in the USA. Dimensions: Each: 4.75" x 4.75" x 8"
Across town, across the country, or across the globe. Filimin connected touch lamps make it easy to stay close with special people in your life, wherever you are—and they were created by Makers John Harrison and Vanessa Whalen for that very reason. John DIY-ed the first version of this WiFi-connected lamp as a gift to help make it easy to keep far-flung family members feeling close. 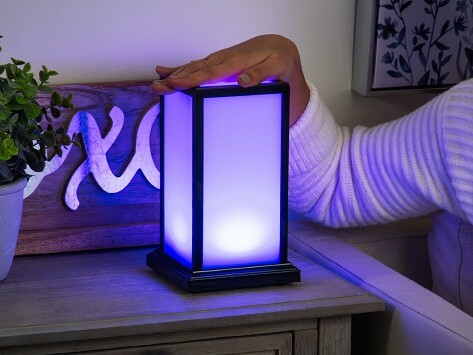 Just tap the lamp and the buddy lamp of a grandparent, kid away at school, or even an entire group of friends will light up with your designated color (there are over 200 to pick from). It's a simple but meaningful way to let someone know you're thinking of them without relying on a phone. Since Filimin began in 2014, John and Vanessa have kept in close touch with their community, too. The lamps are made in their hometown of Wichita, Kansas, in part with the Women's Initiative Network, which helps women recovering from abusive situations find employment. Filimin also employees refugees aided by The International Rescue Committee.